Today we’re very excited to bring you both the chance to win a ticket to the upcoming Knitting & Stitching Show in London (details below) and a new free pattern using our beloved Misti Alpaca Chunky! It’s not hard to fall in love with Misti Chunky. Often times when customers first come to Loop, ready to squish some yarn, they get to the Misti and go, “Ooohhhhhh.” Yep, it’s usually considered the softest yarn in the shop so it’s very hard to give it a squish and then walk away from it empty-handed! Misti comes in some pretty glorious colours too – we have solid and melange colours, as well as naturally dyed and hand-painted colourways, so there’s pretty much something for everyone who loves a good soft-soft-soft yarn – and who doesn’t!? Our Lydia has come up with a super-simple, very quick pattern that’s great for knitters of all levels and perfect for both men and women. So take note: this will be your go-to Christmas gift knitting pattern! It uses just 2 skeins of Misti Chunky, either in one colour or two – we love the tartan-effect the fisherman’s rib stitch pattern gives when you use two colours. Colours clockwise from top left: CP01 and 1662; 4215 and BN07; 533 and 1060. 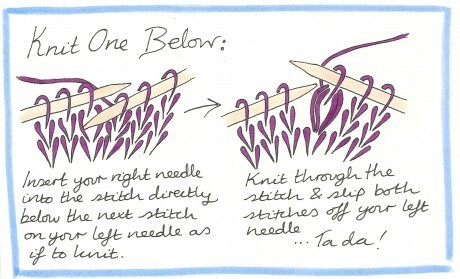 There’s a very simple trick for producing this thick, textured stitch, and talented Lydia has also made a beautiful illustration that reveals all! So you just knit, knit, knit until you’re almost out of yarn, cast off, twist your big rectangle around, sew it up, and voila! 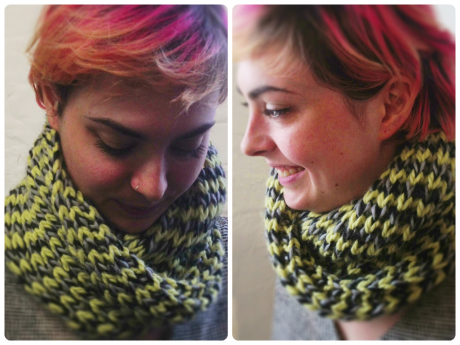 You have a beautifully smushy cowl you can wear looped once or twice, for extra cosiness. Autumn is just around the corner, and this cowl only takes two or three evenings to complete – so no excuses for cold necks in the coming weeks! The full pattern details can be found below. And now for the giveaway fun! We have tickets to the Knitting & Stitching Show up for grabs for three lucky blog readers! The show takes place in London at Alexandra Palace from the 10th to the 13th of October and is crammed full of knitting, crochet, exhibitions, workshops and everything an avid knitter could hope for. Loop will be there again this year and we’d love to see you! If you’d like the chance to win one of these tickets, leave us a comment on this post telling us which Loop yarn is your favourite! Leave your comment by Thursday 12 September, and we will choose the winners which we’ll announce next Friday. Good luck, and happy knitting! 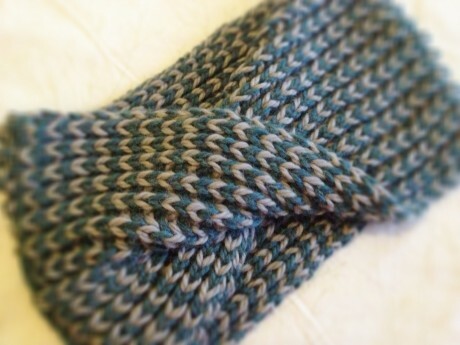 This is a simple, but very effectively snuggly cowl which uses just two skeins of Misti Alpaca Chunky. Misti Alpaca Chunky is perfect for this cowl, it is super soft, and comes in fantastic colours, including handpaints, which would look amazing striped with a solid or melange. 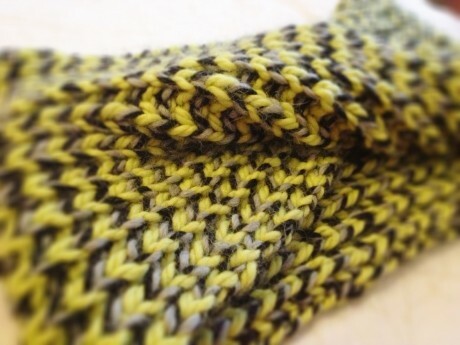 The pattern uses fishermans rib, which creates extra squishy ribbing, if you have never done fisherman’s rib before the only new technique is ‘knit one below’, you can see our tutorial for this stitch above. Notes: This pattern is for a stripey cowl, where you change colour every other row. This way you do not need to break off the colours that are unused, they can just be picked up when needed again. For a neat edge, when changing colours carry the new colour to be used in front of the other colour when picking it up, making sure to not pick up the new colour too tightly. This pattern is written with a regular cast on and seamed, but if you want to you can do a provisional cast on and graft the ends together for a seamless look. Next row: Purl all sts. Row 1: Change to CC, [k1 below, p1] repeat until end of row. Row 2: [K1 below, p1] repeat until end of row. Row 3: Change to MC, [K1 below, p1] repeat until end of row. Row 4: [K1 below, p1] repeat until end of row. Repeat these 4 rows until piece measures approximately 89cm / 35”, or until you have just enough left to cast off and seam your cowl. Cast off all sts loosely in pattern, and sew in ends. Before seaming half twist the cowl into a mobius, then using a darning needle seam the cast on and cast off ends together. 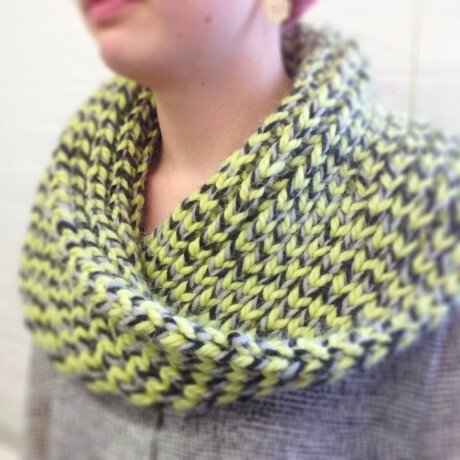 Misti Chunky Cowl is a free pattern and all images and text are copyright of Loop Knitting Ltd. It is for personal and non-profit use only. This means you can knit it for yourself, as a gift or for charity. You may not sell a garment made from this pattern. You may not reproduce this for sale. Please ask if you wish to translate it or use to teach a class. Thank you for this pattern too – it will make an excellent Christmas present! Madelinetosh merino light is my current favourite! Blue Sky Alpacas Metallico! Most beautiful wool ever! 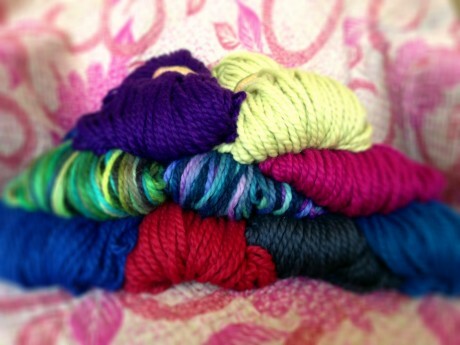 I just love Malabrigo Merino Worsted. So soft and such gorgeous colors! My favourite is the yarn that makes it out of Loop and home with me ! It usually gets furtivelly sqeezed and squished all the way along Camden Passage , down the escalator at the Angel etc etc , all the way back to Hertfordshire . At the moment my favourite is Blue Sky Alpacas’ ‘Blue Sky Bulky’ because there’s something about the texture that reminds me of the knitwear I saw travelling around Ecuador. Misti Chunky was the very first yarn I bought from Loop about 6 years ago when you were still in Cross Street!! It’s so true that its hard to resist after a squish!! My current favourites are Juno Alice Sock with MadTosh sock a close second. All these years of knitting and I’ve never been to Ally Pally for various reasons. I’m really hoping to make it there this year! I absolutely love KPPPM, which I first bought back from the US and was so excited to find at Loop! My go-to basic is Rico Merino Aran since I used it at a Fairisle class a few years ago in your basement. Old Maiden Aunt alpaca silk is so lovely! When I saw it on my only visit to Loop I came away with 2 skeins-Crow Waltz shawl in the making! Would love tickets to Ally Pally- planning on visiting this year! Has to be Malabrigo sock…! Blue Sky Alpaca’s worsted cotton in all colours. I LOVE it! I love anything in alpaca, so would love to knit this scarf in Misti Alpaca Hand Paint Chunky in Vienna or Pico. It would make a lovely present for someone, but I think I’d be loath to let it go once finished! Last time I was at Loop, some very special Symphony Lace with beads and glitter Eternal Diva (dove gray), just literally jumped off the wire wrack into my hand. It so unlike anything I would normally buy – but I’m glad I did. Not that I yet know what it will become. Second favorite was some black Alpaca that became a hat for my daughter’s science teacher. He adores it. I love Rowan Big Wool for its chunky squishy texture! I made a snood with it that I then couldn’t give away as I liked it too much! Also I bought the Kidsilk Haze a while ago to knit my mum in law a scarf and although it was a tricky delicate knit it was so worth it in the end! Oh, 3 of my favourite things in one post. My favourite yarn from the Loop shop is Juno Alice 4 Ply: I knit a total of 3 whole ‘Pretty Thing’cowls from one skein; very well received as Christmas gifts… I love fisherman’s rib for scarves but have never used it for a cowl. I am also completely crazy about the Knitting and Stitching show in Alexandra Palace. I have attended for the past 5 years but this year I am unemployed and money is tight so I have to think twice about it. For me it has to be madelinetosh sock wonderful colours and the high twist gives beautiful stitch definition, just gorgeous! There are so many yarns from Loop I want to try but so far Berocco Ultra Alpaca is my favourite. I’ve used it twice now and want to use it in all the gorgeous colours. My favourite yarn is anything from Shilasdair. The colours are so gorgeous. The dyes are semi-solid so they create something really special when knitted. The fibres used are very special – wool, baby camel, angora and cashmere in the Luxury yarns, and means the metreage is amazing. I knit accessories (scarves, little gloves and wristlets, shawls) with the 4ply and sweaters and cardigans with the DK. 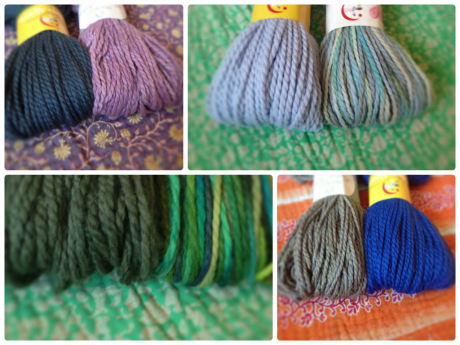 Jitterbug is the one I’ve bought most often, but I think that the Juno yarns are my favourite. I love the Juno Alice sock yarn. I bought a skein on my last visit to Loop and knitted a lacy baktus scarf with it. It’s so soft around the neck and the drape is superb. For me it’s the Malabrigo Worsted which I bought in Velvet Grapes. I have knitted a jumper from a Blue Sky pattern and made a few cowls for friends with the rest. But mostly I just love stroking it – it is soooo sumptuous! 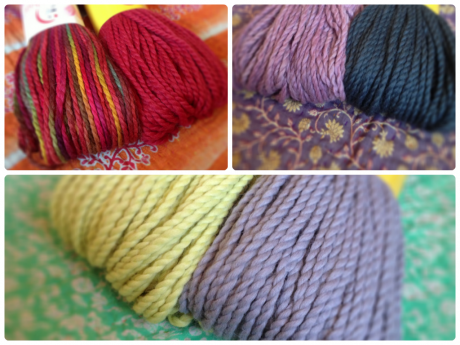 Knit collage…..I love it !! It has to be the Blue Sky Alpaca range. Just so soft and luxurious. Koigu Painters Palette is a favorite of mine! I love its intensity and its springyness. Baby gifts Koigu, Adult garments and accessories Shilasdair…lovely. 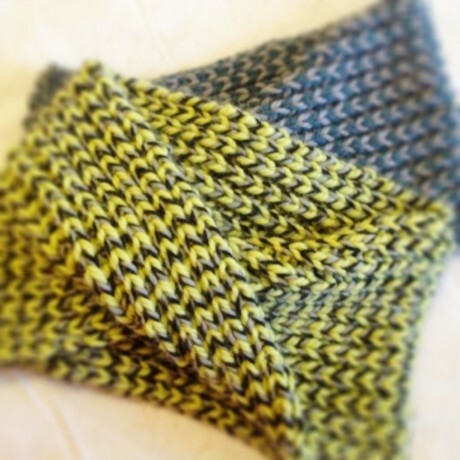 I absolutely love that cowl, the colour combination makes me think of bees and the British Summer! 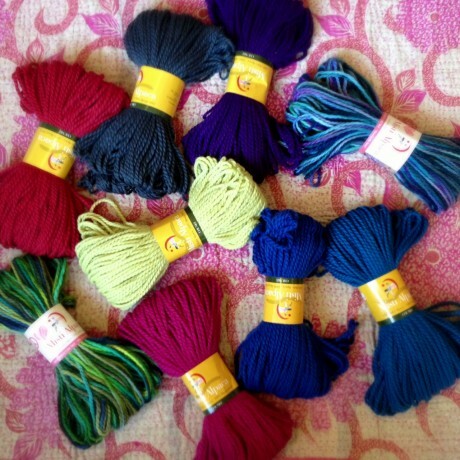 I adore Madelinetosh, the sock yarn is something I am itching to buy!